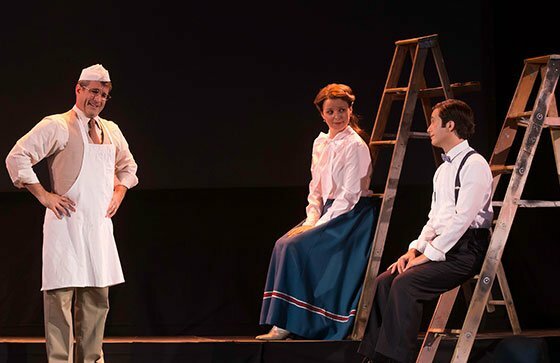 Not every play from the canon of American theater transfers well to the opera stage, but Thornton Wilder’s Our Town has a spareness that makes it an obvious choice for adaptation. There’s room in the drama for music to enter and add something new, and the play is durable enough to withstand a librettist’s departures from the original text. The Wilder estate, however, never granted permission for a musical adaptation until 2005 when it was given to the composer-librettist team of Ned Rorem and J.D. McClatchy. 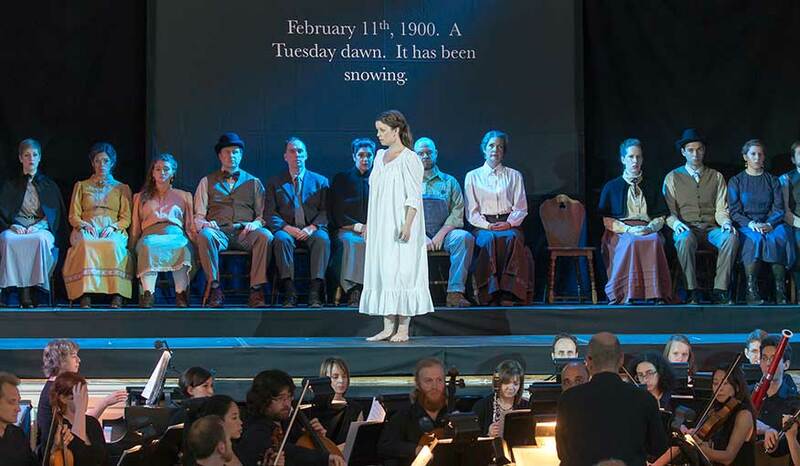 On Sunday afternoon Monadnock Music presented the resulting work in situ at the Peterborough Town House—Peterborough being Wilder’s model for the play’s setting of Grover’s Corners, New Hampshire. Rorem, who turns 90 this year, is a master of American art songs, but surprisingly this is only his second full length opera. It’s not a given that a proven sensitivity to poetry and song transfers into a sensitivity to drama and opera (Hugo Wolf, for instance, wrote only one rather obscure opera), but here Rorem crafts a clear and emotionally resonant structure across two hours of music. Sometimes, however, his lyricism struggles against the talky libretto, and Wilder’s play is treated quite literally. The project certainly could have survived — and might have benefited from — a broader rethinking of the original. Rorem and McClathy preserve Wilder’s three act structure. The first act, set in 1901, introduces the Gibbs and Webb families — and particularly the young Emily Webb, daughter of the local newspaper editor. Rorem’s score begins with a church hymn cut by pangs of astringent chords in the orchestra. This juxtaposition sets the tone and becomes a kind of calling card for the work as a whole. We are also introduced to the Stage Manager, a rather bland narrating character retained from the play. More colorful are the archetypal minor townspeople including an elderly busybody and an alcoholic church organist. The second act, set in 1904, follows Emily’s romance with George Gibbs and concludes with their wedding. This act is more focused and engaging than the first — the wedding scene being particularly poignant. The bride and groom both express private doubts against a very public setting. Rorem’s musical tapestry carries the drama well. The final act, set in 1913, takes place in the town graveyard where most of the characters are now interred. Emily is the new arrival and reflects on her past life before settling in with the dead. The musical treatment is more elegiac and nostalgic than chilling — a distant piano waltz from the orchestra sets the tone for the finale. Monadnock’s cast was superb with soprano Margot Rood as Emily Webb, mezzo-soprano Krista River as Mrs. Gibbs, and baritone Donald Wilkinson as Mr. Gibbs being standouts. Rood’s Emily was innocence personified, while her Gibbs family in-laws made for a dignified small town couple. Gil Rose led the Monadnock Festival Orchestra, a fine group with a small string section, a handful of winds and brass, and a piano. The show was attractively costumed and lit, but Monadnock didn’t bring in a stage director and that absence was felt. The opera, like the play, explicitly requires only a bare minimum of props and scenery, but that doesn’t mean it’s simple to pull off. In general, the production presented each scene in the most obvious way with little depth to the staging. 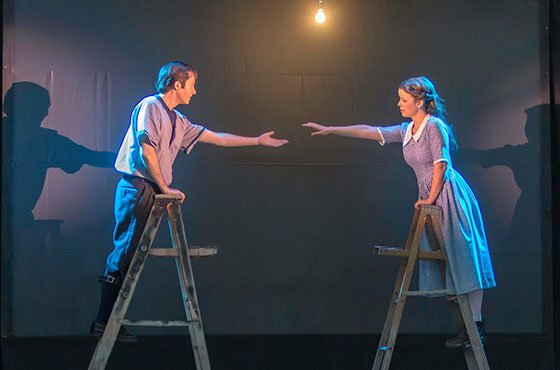 There was one striking visual at the end of the first act as Emily and George ascended twin stepladders (as called for in the original play) and reached hands out to one another in a nice enhancement of Wilder’s stage directions, but a skilled director could have milked the material more arrestingly and more cohesively without even getting fancy. It was a good show, though, and it’s a shame it had just a single performance. Perhaps one of Boston’s small opera companies could adopt the cast and give us a chance to see if this recent opera might have real staying power.